More is known about the Blue Funnel Line than could be found about one of the company’s first steamships, the Ajax. The line, which profited by the development of a new two-cylinder compound steam engine and the opening of the Suez Canal shortly after opening its trade route from Liverpool East to Asian ports, was known as the Blue Funnel Line although its official name was the Ocean Steam Ship Company. The nick-name was the product of happenstance. It seems that barrels of blue paint were left on the deck of the first vessel the company purchased, and they used it to paint a thin blue line around the hull. The stacks, normally black, were painted a light blue with a thin black line around them near the top. The line was founded in Liverpool by Alfred Holt and his brother, Philip, in 1865. Alfred was an engineer and an inventor who developed the engine built and installed in what was to become a major steamship line. Alfred wasn’t new to the business. But the concept of founding his own line grew in 1864 following the development of his new engine. The new design was so innovative that it offered three times the pressure of normal steamers, added speed to the vessels, and reduced the cost of operating. That year Alfred sold his interest in all ships except the steamship Cleator, which he used to try out his new engine. The vessel, commanded by Captain Isaac Middleton. It performed so well that the decision was made to order three new ships and put them on a regular trade route to the east. The regular ports of call included Mauritius, Penang, Singapore, Hong Kong and Shanghai. All of the ships of the line carried classical names. Those first three vessels, built at Greenock, were named Agamemnon, Ajax and Achilles. The names were taken right out of Homer’s Odyssey. 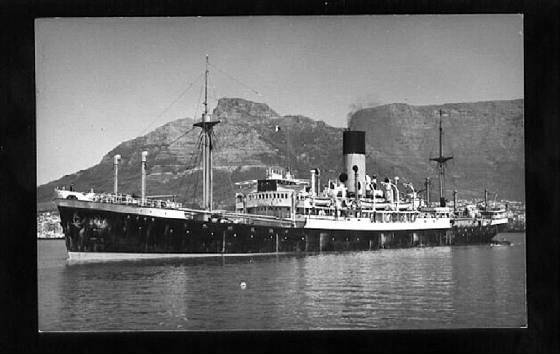 All of the initial ships in the line were designed to carry only freight although the Cleator also had cabin services for passengers. There were to be two steamships that bore the name Ajax for the Blue Funnel Line. 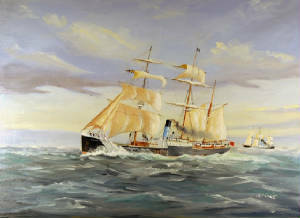 The first Ajax was commanded by Captain Alexander Kidd from its first voyage, starting on July 1, 1855 until he was lost overboard on Sept. 2, 1883. The Ajax was accidentally sunk while moored at Shanghai in 1868. While repairs were being made, the engineer working on the shaft that attached the engine to the propeller shaft was unable to finish the task, and left with plans to finish the job the next day. During the night the outgoing tide unscrewed the propeller and its shaft, opening the stern pipe and sinking the ship to the decks. The vessel remained sunk for 24 days before it was raised, and there was a lot of internal water damage, especially to the wood superstructure. Alfred solved this problem by redesigning the coupling flange so it was larger than the hold, thus making it watertight. That was a common problem on all propeller driven ships at that era and the new design was probably adopted quickly by other steamship lines. The first Ajax remained in service until 1897. It was sold to a Dutch firm that scrapped her in 1900. A second Ajax was put in service in 1900 and it remained in service until 1930 when it too was scrapped. The third Ajax was added to the fleet in 1931 and it ran until 1957 when it was sold to the Glen Line.